Image Comics is pleased to announce that New York Times bestselling author Brian Buccellato (SONS OF THE DEVIL, The Flash, Injustice), Jennifer Young, and artist Matias Bergara (Sons of Anarchy) are teaming up for a southern-gothic horror series set to launch this October 2016. In CANNIBAL #1 a small Everglades town is hit by a new virus that causes those it infects to crave human flesh. But with no cure in sight, the region has become split over what to do with the victims. For the Hansen family the answer is simple: kill them. However all of that changes when the virus infects those the family cares about most. This is the second collaboration by Buccellato, Young, and Bergara, following the short story, “Jennifer” which appeared in SONS OF THE DEVIL, VOL. 1. 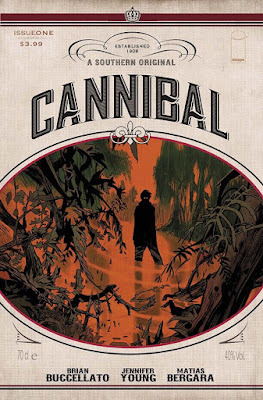 CANNIBAL #1 (Diamond Code AUG160575) will hit comic book stores on Wednesday, October 5th. The final order cutoff deadline for retailers is Monday, September 12th, 2016.